LiveCode LessonsLiveCode LessonsHow To - LiveCode Server Tasks Installing LiveCode ServerHow do I install LiveCode Server on OS X with Apache? This lesson will walk you through the steps required to install LiveCode Server on OS X with Apache. Apache is the most most popular web server package available today. Installing Apache will allow your machine to function as a web server, hosting websites and serving web pages. By default, OS X comes with Apache installed with the relevant files being contained in the folder /etc/apache2/. To enable Apache, you need to turn on "Web Sharing" from within the "Sharing" pane of "System Preferences", as in the image above. Begin by downloading the LiveCode server zip file for OS X using the instructions detailed in the lesson "How do I install LiveCode Server?". Unzip the package into your desired location - for example in your home folder. Next, you need to modify your Apache configuration files. To get access to you Apache configuration files, navigate to the folder /etc/apache2/. To do this, open up finder, click on the "Go" menu, select "Go to Folder", type in /etc/apache2/ and click on "Go". This should open up a new finder window displaying the contents of the Apache folder. Here <username> is the name of the user whose conf file you are editing and <path to LiveCode Server folder> is the full path to the folder you unzipped the LiveCode Server files into. You are now ready to test your installation. To do this, create a file named "test.lc" in the "Sites" folder in the home folder of the user you have configured for. The "Sites" folder is the location for all the user's web pages. 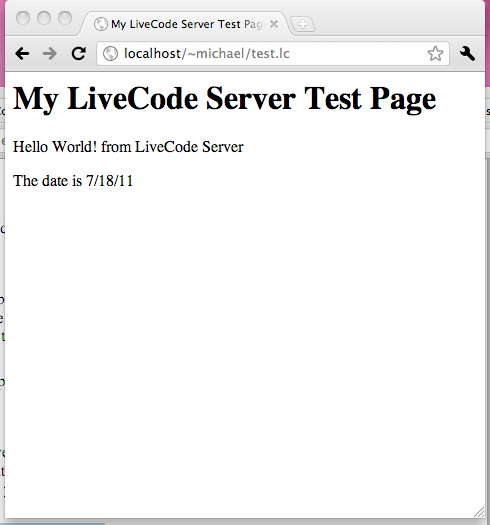 Next: How do I install LiveCode Server on Windows with Apache? So if some of your HTML/LiveCode pages are named with the .lc suffix and others have the .irev (or some other) suffix, you can include both suffixes in "AddHandler" and all your LC pages will be handled correctly. The option for web server is no longer on Mountain Lion. How do we get this to work on a Mac running Mountain lion? 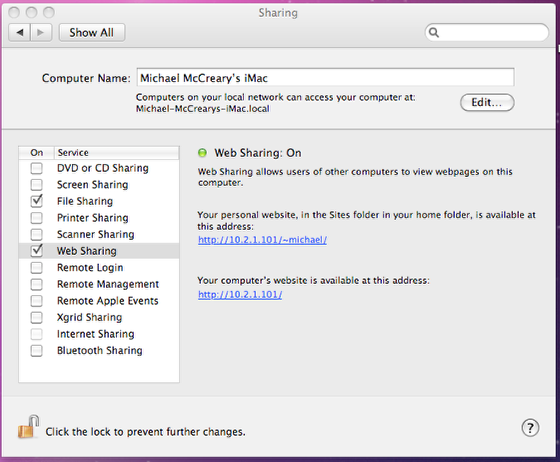 Apple removed the Web Sharing option from the Sharing dialog in Mountain Lion but the apache server does still seem to be distributed with Mountain Lion. Now there are many approaches you could take at this point and it is hard to say which one is best for you. The bottom line is that there is no nice button that does this for you anymore. You approach may be to activate the apache server manually, by following various instructions that are described in many posts on the internet. You could also install other party applications that provide this kind of functionality for you. I have OSX Server installed on Mavericks - what is my best route to installing LC Server? should cover all the information you need. Is there anything in particular you are having problems with? I am running LC Server with Mac OSX Mavericks and OSX Server. Using the Server app, I can easily turn Websites on and off to reset Apache. Also had to change execute access to the LC Server directory which I put in /Library/Server where other server files are stored. OSX Server also has a Alias feature to direct access to wherever you want to put the web page files. Ach I can see that where I wrote 'opening tag' username 'closing tag' in my previous comment the system has swallowed it up and now is displaying a non-sensical ".conf"
Regarding the lack of Web Sharing option from the Sharing Preference pane from Mac OS post Lion, I have encountered this issue while trying to set up LiveCode on a Mac with MacOS Sierra. I have found the following article which suggests a couple applications to get around this change. It suggests Anvil or MAMP. Has anyone tried either of these? Any comments or suggestions? Hi, the above link http://lessons.runrev.com/spaces/lessons/buckets/809/lessons/36651 doesn't work. Can you correct it? Thank you Torsten, I have corrected the links.